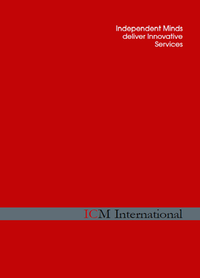 ICM Advisors is the valuation and strategic services firm of ICM International, leading European professional services network of firms specialized in technology and marketing Intangible Assets and IP Business Valuation, Strategy & Finance, Advanced Competitive Technology Intelligence, Systematic Innovation and Technology Transfer. Our advisors, analysts and subject matter experts operate in 6 offices in Europe (Geneva - Düsseldorf - Karlsruhe - Milan - Munich – Turin). ICM Advisors provides Valuation and Strategic Services to support companies in maximizing the strategic and financial value of their businesses IP and Intangible Assets portfolios. The firm’s mission is to create wealth for its clients through the strategic and financial use of intellectual property and intangible assets. The firm has a strong specialization in industrial and financial management of IP and intangible assets supported by valuation methodologies recognized by the financial community and proprietary methodologies at the state-of-the-art of the best international practices. The high seniority of its advisors, with international experience in many industries and with multi-disciplinaryskills such as marketing, technology, business strategy, economic-financial valuation, corporate finance and development of international markets, enables robust strategic and financial valuations.